Since 1981, Dr. Scott Wehrkamp and Dr. Jeff Wehrkamp have been providing patients from Sioux Falls and beyond with exceptional dental care. We have very high standards when it comes to creating healthy, beautiful smiles. Not only do we work very hard to achieve customer satisfaction, we also offer a comprehensive range of today’s best preventive, cosmetic, and restorative services. With our wide range of offerings, we know we can deliver care that meets very specific needs. Our Sioux Falls patients are especially excited by the cosmetic dentistry services we offer. Thanks to cosmetic dentistry, patients who have teeth that are cracked, chipped, stained, misaligned, or oddly spaced can look forward to enjoying a new sense of confidence and wellbeing after just a few visits. All of these services are truly great for helping our Sioux Falls patients overcome the different problems keeping them from smiling openly and with confidence around others. But in addition to offering a range of today’s best cosmetic services, Drs. Scott and Jeff Wehrkamp also offer a revolutionary restorative service known as dental implants. Much like traditional crowns, bridges, partials, and dentures, dental implants are used to help patients who are missing one or more teeth create full, healthy smiles. But unlike traditional restorative treatments, dental implants don’t just replace the part of your smile that shows they also restore your smile’s structural integrity. A tooth is composed of a crown on top and a root on the bottom. When you lose a tooth, you also lose the root that anchored it to your jaw. Tooth roots are important, because not only do they anchor teeth to the jaw, they also contribute to new bone growth in the jaw. 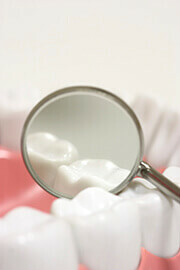 When one or more teeth are lost, the jaw may weaken over time, resulting in further tooth loss, among other problems. Dental implants are designed to mimic natural functionality and appearance. Of course, not every patient is an ideal candidate for every one of our services. To know what kind of care is right for you, see Dr. Scott Wehrkamp or Dr. Jeff Wehrkamp for a consultation. During your visit, we’ll be happy to assess your needs and recommend a personalized treatment plan. We also want to encourage our Sioux Falls patients to see us twice a year for regular checkups and cleanings. Enjoying good oral health begins with regular care.